Carbon-14 dating techniques were first developed by the American chemist, Willard F. Libby at the University of Chicago in the 50's, for which he received the Nobel Prize in Chemistry in 1960. It has a radio half-life (T 1/2) of 5,730 years and is a low energy beta emitter with a radioactive range in air of ten inches. It is produced currently at a fairly constant rate in the upper atmosphere through the action of cosmic radiation on Nitrogen-14. About 21 pounds of Nitrogen is converted each year making about 1/trillion atmospheric carbon atoms radioactive 14C. The 14C then makes its way fairly evenly throughout the atmosphere and living things incorporate it into their carbon "skeletons". When they die, they no longer obtain more 14C to incorporate, and so, the 14C decays back into 14N without being replaced. A ratio can then be established and compared with the known half-life of 14C. Then an age can be obtained for the organic material. To understand this process we must first understand a little bit about the atoms themselves and how they get their names. Most carbon atoms have six positively charged protons and six uncharged neutrons. Since protons and neutrons weigh about the same, the atomic mass of ordinary carbon is 6 + 6 = 12. It is called "Carbon-12," which is abbreviated "12C." The fact that the atom has six protons is what makes it carbon. Most nitrogen atoms have seven protons and seven neutrons, so their atomic mass is 7 + 7 = 14. The fact that it has seven protons is what makes it nitrogen. Other atoms are also named based on the number of protons they carry. Notice in the diagram that eight different isotopes of Carbon are illustrated. Three of the Carbon isotopes (12C, 13C, and 14C) are found in nature. The rest of the carbon isotopes are only of laboratory interest. To the left side of each C (C is the symbol for Carbon) are two numbers, the bottom number indicates the Atomic Number or the number of protons in the nucleus. Since all the atoms are carbon, they should all have an Atomic Number of 6. The top number is the Mass Number for each isotope. The Mass Number for any isotope is the addition of all the protons and neutrons in the nucleus. Looking at the first isotope in the chart, Carbon 9 has 9 (protons + neutrons). Remember that the Atomic Number (the bottom number) indicates the number of protons. So simple arithmetic should tell us the number of neutrons. Carbon 9 has 3 neutrons. Carbon 10 would have 4 neutrons and Carbon 11 would have 5 neutrons, and so on. What should catch your attention is the nature of the various carbon isotopes. Only two of the carbon isotopes are stable (12C and 13C). They constitute essentially 100% of the carbon in our world, although 12C is obviously much more common (99%). All the other Carbon Isotopes are unstable and they degrade into something else. Notice that the farther away the Mass Number gets from 12-13, the faster they break down (The blue numbers indicate half-lives, the time it takes for one half of the atoms in a sample to break down.). So the farther the carbon is from the norm, the more unstable it is. 9C, 10C, and 11C have too few neutrons so when they breakdown, they release a positron which effectively turns a proton into a neutron. The opposite occurs with 14C, 15C, and 16C. They have too many neutrons so they breakdown, releasing a beta particle which effectively converts a neutron into a proton. Thus the breakdown of radioactive atoms is a self-corrective process; those Isotopes which have too many neutrons loose a neutron in the beta decay, and those Isotopes which have too few neutrons gain a neutron in the positron decay. Looking specifically at Carbon-14, we see that it is a Beta emitter with a half life of 5730 years. When Carbon-14 emits a beta particle, the Carbon-14 atom becomes a Nitrogen-14 Atom. Looking at the Mass Number and Atomic Number of the atoms we see that the atom has lost a neutron and gained a proton. Also you will see that the Mass and Atomic Numbers in the equation are equal on both sides of the equation. The atoms that we are particularly interested in are the ones that make up the earth's atmosphere. These include nitrogen (78 percent), oxygen (21 percent), argon (0.9 percent), carbon dioxide (0.03 percent), varying amounts of water vapor, and trace amounts of hydrogen, ozone, methane, carbon monoxide, helium, neon, krypton, and xenon. Cosmic rays, which contain even higher levels of energy than ultraviolet light, cause some of the atoms in the upper atmosphere to fly apart into pieces. Neutrons that come from these fragmented molecules run into other molecules. When a neutron collides into a Nitrogen-14 atom, the Nitrogen-14 turns into Carbon-14 along with a proton. So in this reaction, a neutron is captured by the nitrogen atom and a proton is released. Thus in the nitrogen atom, a proton is effectively converted into a neutron, which allows a Carbon to be produced. Two other reactions (Oxygen-17 reacting with neutrons, and He-4 reacting with Carbon-13) both produce Carbon-14, but with much smaller yields. It has been estimated that about 21 pounds of 14C is produced every year in the upper atmosphere. So in addition to 12C and 13C, which are both naturally occurring, 14C is also naturally occurring in our world. However, unlike both 12C and 13C, 14C is unstable. The only reason why 14C continues to be found on Earth is because of its continued production in the upper atmosphere. The amount of nitrogen in the atmosphere is effectively constant. The conversion of a nitrogen atom to a carbon atom does decrease the total number of nitrogen atoms, but it makes about as much difference as removing a teaspoon of water from the Pacific Ocean. Remember, all the carbon in the entire atmosphere makes up less than 0.03% of all the atoms in the atmosphere. Also, 14C is rare compared to the other carbon isotopes, being found in only trace amounts at around 1 part per trillion (0.0000000001%) of the carbon in the atmosphere (Link). So, if the amount of nitrogen in the atmosphere stays the same, and the amount of cosmic radiation stays the same, 14C will be produced at a steady rate. If the atmosphere started out with absolutely no 14C, there would be a certain amount after one year of exposure of nitrogen to cosmic radiation. After two years, there would be twice as much 14C. This "birth rate" would be constant. But what about the death rate? Stable carbon has six protons and six neutrons. Stable nitrogen has seven protons and seven neutrons. Stable oxygen has eight protons and eight neutrons. But 14C is not so well balanced. It has six protons and eight neutrons, which makes it unstable. Sooner or later, one of the neutrons spits out an electron and becomes a proton. This gives it seven protons and seven neutrons, which makes it nitrogen. One cannot predict exactly when a particular 14C atom will emit an electron and turn into 14N, but the statistics are very predictable. Given a large number of 14C atoms, we can say with a high degree of confidence that half of them will turn into 14N in 5,730 years. This is called the "half-life" because half of the 14C will disappear in that time. At the end of that time, half of the remaining 14C will turn into 14N in another 5,730 years (the second half-life). As one would expect, the exponential curve of radioactive decay does not give accurate results at either extreme of the curve. It does not work very well on things that died a few hours ago, nor does it work well on things that died several tens of thousands of years ago. Let us plug a few numbers in the equations and see why. Suppose we want to use 14C dating to determine when Abraham Lincoln died. We could dig up his casket and take a sample of the wood from it. If the tree that made the casket was cut down 135 years ago, the ratio of 14C to 12C in that wood sample divided by the ratio of 14C to 12C in the air today should be 0.983803. But suppose our equipment for measuring the ratio is only accurate to 0.1%. Then our measurement could be off by one digit in the third decimal place. In other words, our measured ratio might be between 0.982803 and 0.984803 because of the limited accuracy of our equipment. Plugging these two ratios into the equation that converts the 14C ratio into time the calculation yields a range of dates between 143.4 and 126.6 years ago. What it boils down to is that a 0.1% error in the measurement produces up to a 6.2% error in the result. Now, lets try a few other thought experiments and see what happens. Lets try the same experiment on King Tut's coffin. King Tut died in 1,325 BC. So, the wood in his coffin should be about 3,325 years old. The normalized 14C ratio should be 0.668846. But, if the measurement is only accurate to 3 decimal places, it might be between 0.667846 and 0.669846. This would yield dates between 3,312 and 3,337 years old. That is an error of 12 years, but it is only and error of up to 0.4% of the correct value. The absolute error (12 years) is larger than the absolute error for Abe's casket (8.6 years), but when you are talking about 3,325 years, what is 12 years, more or less? So we see why carbon 14 may work very well for dating things that died a few thousand years ago though not so well for things that died recently. As might be expected though, the same problems in dating young samples plague the accurate dating of very old samples. When the time since death gets very large, the slope of the radioactive decay curve gets very flat. This results in very large errors. For example, imagine a piece of wood from a tree that was cut down 50,000 years ago. Its normalized 14C ratio should be 0.002362. A 0.1% error in measurement (0.001362 to 0.003362) yields ages ranging between 47,082 and 54,551 years. That is an error of up to 2,918 years on the young side (which is 5.8%) and 4,551 years on the old side (which is +9.1%). Remember that the ratio of 14C to 12C is about 0.6% today. If you multiply 0.6% by 0.002, you are trying to measure the amount of 14C when it is only 0.0012% of the total sample. So, even a small amount of contamination will corrupt the results in a very significant way. That's why 50,000 years is the generally quoted as the practical limit for 14C dating generally mentioned in the scientific literature. Anything thought to be older than 50,000 years is said to have an "infinite" carbon age. So, we can see that 14C is very limited for the dating of anything considered to be even close to the supposed ages of lets say, "millions of years". But, what about those creatures that lived less than 50,000 years ago? How do they get 14C inside of themselves and them stop getting 14C inside of themselves when they die? As long as a plant is alive, it takes carbon dioxide from the air and water from the ground and converts them into sugar. Since about 0.6% of the carbon in the carbon dioxide it breathes is 14C, about 0.6% of the carbon atoms in the sugar it builds will be 14C. Animals eat plants to get the sugar they need to survive. Since 0.6% of the carbon they get from sugar is 14C, about 0.6% of the carbon in their muscles, bones, fat, etc. will be 14C. When a plant or animal dies, no new carbon atoms are acquired. For example, the wooden boards used to make King Tut's coffin are not acquiring any more carbon of any kind today. But the 14C in those boards is slowly decaying into nitrogen (14N). So, when a scientist takes a sample of King Tut's coffin and measures the ratio of 14C to 12C, the ratio will be lower than it was when the wood was alive because about 33% of the 14C atoms in it have turned into 14N. Obviously then, if the original ratio is known and the current ratio is known, the time involved can be easily calculated based on the known half-life of 14C. "The troubles of the radiocarbon dating method are undeniably deep and serious. Despite 35 years of technological refinement and better understanding, the underlying assumptions have been strongly challenged.... It should be no surprise, then, that fully half of the dates are rejected. The wonder is, surely, that the remaining half comes out to be accepted. There are gross discrepancies, the chronology is uneven and relative, and the accepted dates are actually selected dates." What happens if the ratio of 14C as compared to 12C in the atmosphere fluctuates over time? If this were to happen, in a significant way, might this not be a very big problem for accurate dating? The assumption we have to make when computing 14C dates is that the ratio of 14C to 12C is essentially the same today as it was when the organic material we are dating died. Certainly this is the assumption that scientists must make, but is this a valid assumption? Is there evidence that may undermine the validity of this assumption? "Throughout the conference emphasis was placed on the fact that laboratories do not measure ages, they measure sample activities. The connection between activity and age is made through a set of assumptions... one of the main assumptions of C14 dating is that the atmospheric radiocarbon level has held steady over the age range to which the method applies." Report on 14th Conference, 145 International Scientists, Science, Vol. 150, p. 1490. One really interesting problem is that the ratio of 14C to 12C is not in equilibrium at all but is increasing fairly rapidly and is known to have fluctuated significantly throughout history - perhaps due to various long term weather changes, huge geologic events, or other catastrophic changes affecting the biosphere. This changing ratio is the reason why carbon 14 dates are not determined by directly looking at the ratio of 14C to 12C. Surprisingly enough, this is not how carbon 14 dating is done at all. What has to be done in order to get "accurate" carbon 14 dates is that the ratio of 14C to 12C must be "calibrated" or compared to the 14C to 12C ratios in organic samples of known historical ages - like King Tut's coffin. So how, exactly, is this calibration done? One method of carbon-14 dating calibration involves the use of tree rings. Scientists have counted thousands of tiny tree rings from very long-lived trees called the bristlecone pines. Then, assuming that these trees only produce one ring per year, they determined how old the trees were when they died (In reality a tree may in fact produce several rings or no rings in a given year depending on environmental factors). 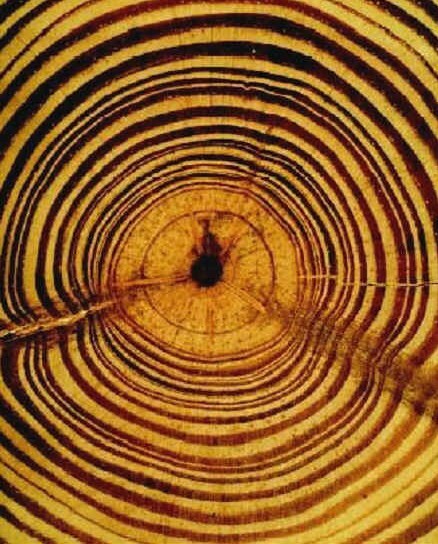 By correlating the youngest rings with rings of living trees, they determined the year when the trees died and, presumably, knew how long it had been since each tree-ring died. Interestingly enough though, when carbon 14 dating was performed on the oldest rings, the "age" was significantly different when compared to the number of rings. For example, say that a very old living tree has 2,500 rings. It seems at least reasonable then that this tree is around 2,500 years old and that the innermost rings are the oldest rings - right? 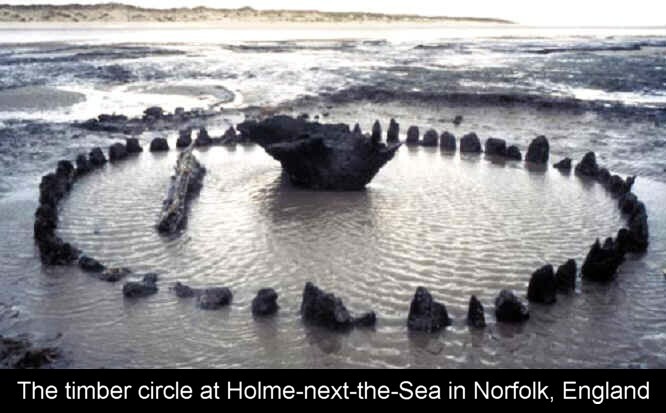 Since the innermost rings died 2,500 years ago, the ratio of 14C to 12C detected in these innermost rings, as compared to the current ratio of 14C to 12C in today's atmosphere, should give a very direct "age" of these rings that is very near 2,500 years - right? Wrong! The carbon-14 "age" will not match the tree ring "age" very well at all. So now what? Well, fudge factors (which are called "calibration"Â� factors) are used to "correct" the carbon 14 date. Is it all starting to sound a little less solid now? Many scientists are fond of claiming that all the various dating methods "agree" with each other. Well, of course they do if they are all "calibrated" so that they have to agree with each other. The fact of the matter is though that even the most reliable dating methods, such as tree ring dating and carbon-14 dating, do not agree with each other in an independent way and must therefore be calibrated with each other in order to make any sense. Of course, the process of calibration itself adds just one more level uncertainty to the date calculation. But, this uncertainty might not be too terribly significant depending upon the reliability of the calibration techniques. The theory of carbon-14 calibration is relatively straightforward. Naturally occurring materials that exhibit annual growth phenomena (e.g., tree rings, lake and marine varves, etc.) are carbon 14 dated as precisely as possible over age ranges that can (ideally) be dated absolutely via other historical methods. The resulting calibration curve shows the relation between conventional 14C dates and calendar ages, its trends and "wiggles" reflecting the variation of the 14C to 12C ratio in the atmosphere over time. Once generated, the calibration curves (or more accurately, their underlying data sets) enable the conversion of a date in radiocarbon years to a calendar age range or ranges. But, what happens it if turns out that these calibration data sets are significantly in error? Tree ring dating is based on a simple and seemingly straightforward notion that every year a tree forms one ring in the wood that it creates as it grows. All one has to do to determine the age of the tree, to a fairly good estimate at least, is count the rings. The first scientist to really start doing this as a serious means of dating things was Andrew Ellicott Douglass (1867-1962). Douglass was an American astronomer who is now generally credited with being the "Father of Dendrochronology". Beginning around 1884 he discovered a correlation between tree ring patterns and sun spot cycles, but his findings and conclusions were initially doubted by most scientists of his day. Later Edmund Schulman (1908-1958), from the University of Arizona, took up the notion of tree ring dating and in the process made Bristlecone pines famous. 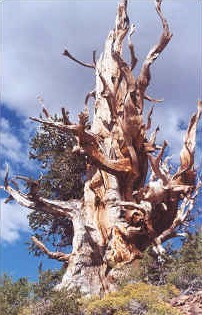 Schulman studies these very old tree for over 30 years (primarily in the White Mountains at elevations between 9,500 to 11.500 ft). Then came Charles W. Ferguson. Starting about 1967, with the help of H.C. Fritts, Ferguson carried on the work of studying Bristlecone pines that was started by Schulman. It was Ferguson who noticed that the dead wood scattered on the surrounding slopes did not match the existing ring patterns of the living trees. This mismatch seemed to create a gap in time between the living and dead wood. The living trees could be dated as far back as 4,700 years. The Methuselah Tree is has around 4,767 rings, making it the oldest living tree on Earth (Outside of arguments that some clonal plant colonies, to include some trees, can live much longer. The most extreme example identified is a stand of quaking Aspen (Populus tremuloides) in Utah nicknamed Pando, thought to be 80,000 years old - based on radiocarbon dating of course. As the National Parks Service puts it, "Aspen are so different that it may be better not to think of them as trees. A stand of aspen is really only one huge organism where the main life force is underground"). This "gap" between the living and the dead wood was first breached by A.E. Douglass while testing prehistoric beams in the ruins near Show Low, Arizona. After this gap was breached, Ferguson was eventually able to construct a continuous tree ring record reaching as far back as 8,680 years before present (B.P.). Then, during the 1980s, Ferguson was able to extend this continuous sequence back to about 11,300 years B.P., using radiocarbon dating to help with the validation process. The way such gaps are breached is also rather simple and straight forward in theory. All one has to do is find matches in the pattern of the tree rings found in the living trees as well as the dead trees. This overlap is used to create a sequence that links up different pieces of wood to make a longer sequence. This method is what was used to create the Bristlecone pine sequence. Similar tree ring chronologies and dates have since been obtained for European oak and pine tree sequences. Such sequences have also been used to correct or "calibrate" radiocarbon dates. 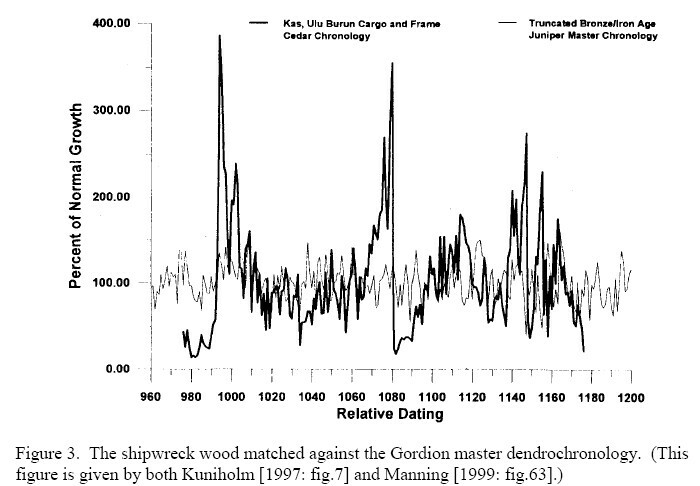 In this light it is interesting to note that radiocarbon dates have also been used to calibrate tree ring dates. Certain studies have shown that occasionally Bristlecone pines do not produce a ring for a given year and, more commonly, produce an extra ring during some years. Lammerts (1983) found extra rings after studying the development of Bristlecone saplings. He suggested that the existing chronology should be compressed by up to 20% because of this problem alone.23 Publications and online articles from the Dendrochronology Department of the University of Arizona also show that the science of dendrochronology is not all that straightforward. 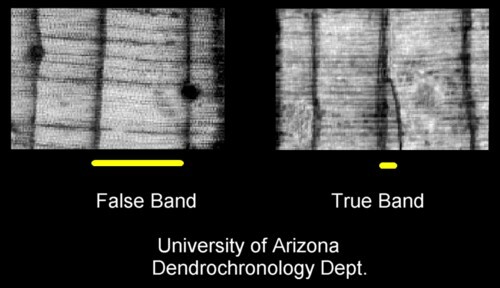 A great deal of subjective interpretation is required to judge between true and false rings and true and false pattern matches between different pieces of wood. For estimating the ages of trees that are still living, this doesn't seem to be a significant problem, but when it comes to matching up wood from different trees, to create an extended overlapping chronology, the problems become a bit more difficult to overcome. Consider a 1986 paper written by D. K. Yamaguchi.11 In this paper Yamaguchi recognized that tree rings tend to "auto correlate" or actually cross-match with each other in several places within a tree-ring sequence. What he did to prove this was quite interesting. He took a 290-ring Douglas-fir log known, by historical methods, to date between AD 1482 and 1668 and demonstrated that it could cross-match in multiple places with the Pacific Northwest Douglas Fir Master Growth-ring Sequence to give very good t-values. A t-value is given to a wiggle-match on the basis of a statistical analysis of the correspondence between two wood samples. 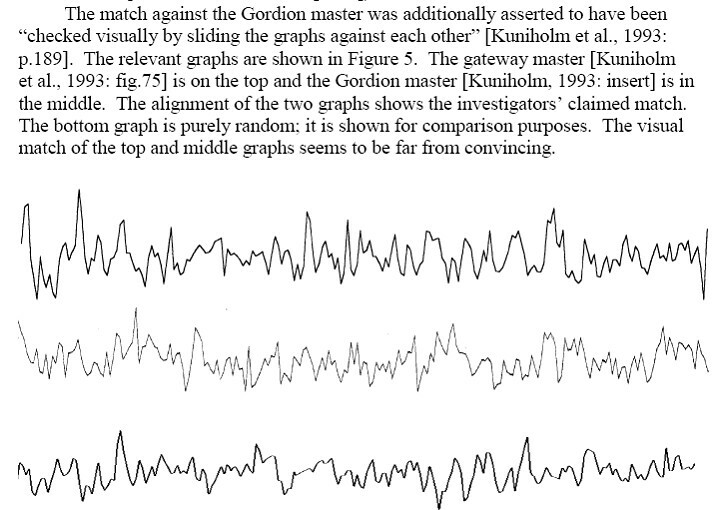 This statistical assessment is done by computer which assigns high t-values (3 and above) to good wiggle-matches and low t-values (below 3) to those with poor correspondence between the ring patterns. Amazingly, using such t-value analysis, Yamaguchi found 113 different matches having a confidence level of greater than 99.9%. 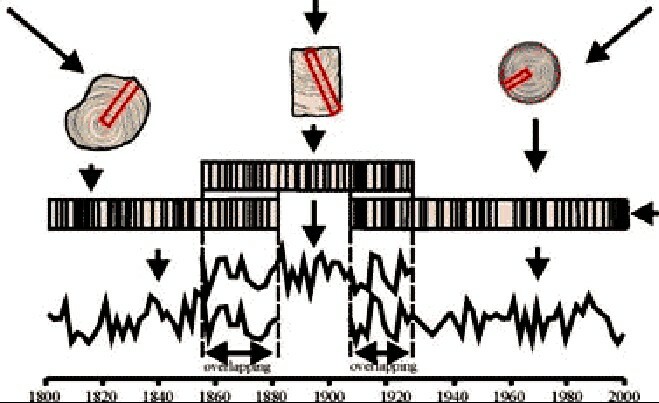 For example, Yamaguchi demonstrated that his log could cross-match with other tree-ring sequences to give t-values of around 5 at AD 1504 (for the low end of the ring age), 7 at AD 1647 and 4.5 at AD 1763. Six of these matches were non-overlapping.11 That means that this particular piece of wood could be dated to be any one of those six vastly different ages to within a 99.9% degree of confidence. Turkish dendrochronology is quite interesting and relevant to this discussion and the understanding of the science of dendrochronology as a whole. One especially interesting example has to do with the work of Kuniholm and his dating of wood from the city gateway at Tille HÃƒÂ¶yÃƒÂ¼k - an ancient city. What happened was that the t-value wiggle-match produced by computer analysis came up with not one, but three matches of 1258, 1140, and 981 B.C. - each with a greater than 99.9% certainty.19 Notice the figure detailing false matches from Tille HÃƒÂ¶yÃƒÂ¼k at right. Also notice the alignment of the Tille HÃƒÂ¶yÃƒÂ¼k sequence with the Gordion master sequence (figure above) and with a completely random sequence. Which one has a closer match? It all seems rather subjective does it not? - and this is done with computer assistance. Why the significant difference in matches depending on which master was chosen? In the same article, the authors go on to note that radiocarbon dating of these same trees show a statistical accuracy of agreement of only 26.7%. The authors explain that, "Interlaboratory offsets, errors and regional variation in the radiocarbon content of the atmosphere may be significant when producing precise archaeological chronologies. "24 If this is true, exactly how "precise" can one be when producing theories based on dendrochronology or even radiocarbon dating? "In almost all branches of science, other than tree-ring studies, there is a check on the validity of published research: other researchers can, and often will, independently seek to replicate the research. For example, if a scientist does an experiment in a laboratory, comes to some interesting conclusion, and publishes this, then another scientist will replicate the experiment, in another laboratory, and if the conclusion is not the same, there will be some investigation. The result is (i) a scientist who publishes bogus research will be caught (at least if the research has importance and is not extremely expensive to replicate) and (ii) because all scientists know this, bogus science is rare. Tree-ring studies do not have this check, because the wood that forms the basis of a tree-ring study is irreplaceable: no other researchers can gather that wood. As discussed elsewhere on this website, other calibration methods also have problems when it comes to the carbon 14 dating of specimens older than 4 or 5 thousand years. Most of the problem with these methods is that there is no standard rate at which layers form; be they lake varves, ice-core layering, coral colonies, tree rings etc. None of these is consistent. Many lake varves can form even in one day, not to mention one year. Many snowstorms or warm and cold spells can happen in a given season and make many layers, or few layers per year. Not only is carbon 14 dating limited in its theorectical usefulness any farther back in time than 50,000 years,3 but its dating accuracy seems to be in question for anything greater 4 or 5 thousand years. This is possibly do to the fact that the 14C atmospheric concentration (relative to 12C) is rising and is not the same as it was only a few thousand years ago. Now, suppose there had been a major atmospheric disturbance, such as the one described in the flood "myths" of many diverse cultures about 5,000 years ago. If true, might such a global catastrophe be expected to alter the 14C to 12C ratio just a little bit? Perhaps, but by how much and would this really be significant? Consider, for argument's sake, what would happen to the carbon-14 dating assumptions if there was a significantly greater quantity of carbon 12 in the biosphere of this earth sometime in the recent past. What would happen to the 14C to 12C ratio? It would be reduced - right? This reduction in the 14C to 12C ratio would give an increased apparent age to start out with, relative to our present day 14C to 12C ratio. Unless the production of carbon-14 was equally greater in the past (either via markedly increased nitrogen 14 and/or radiation), such a huge increase in carbon-12 would dramatically lower the ratio of 14C vs. 12C (equivalent to about 7 half lives). Obviously then, this would completely throw off the whole basis of carbon-14 dating going farther back in time beyond such a catastrophic event or closely spaced events. Certainly then, carbon-14 could not be used to rule out the recent occurrence of such a global catastrophe. Given such a global catastrophe that removed huge quantities of carbon-12 from the biosphere, a rapid increase in the 14C to 12C ratio would certainly follow. Consider that if an animal or plant lived during this time of rapidly increasing carbon-14 levels (relative to carbon-12) that different portions of the plant or animal would have different 14C to 12C ratios incorporated into these different parts depending upon the rate of growth. Those areas of the animal or plant that grow faster would exhibit higher levels of carbon-14 over time as compared to those parts of the animal or plant that grow more slowly or have stopped growing altogether (as in the case of tree rings). For example, hair grows fast, so we might expect to see higher levels of carbon-14 in hair as compared to slow growing bone, muscle, or brain tissue. In light of this, consider that different parts of well preserved creatures or other surrounding organic materials have returned very different carbon-14 dates. For example, the scalp muscle tissue of the "Fairbanks Creek Musk Ox" was carbon-14 dated to be 24,000 years old while the hair of this ox was carbon 14 dated at 17,000 years old.17 Also, consider the following quotation from the journal Science concerning the increasing levels of carbon-14 in bristlecone pine trees. There is yet another very interesting problem with 14C dating. Significant amounts of carbon-14 have been detected in specimens previously thought to be millions of years old, to include coal, oil, and even carboniferous portions of fossils belonging to dinosaurs etc. Of course this would seem to be impossible because of the fact that carbon-14 in any amount cannot theoretically exist beyond 75,000 to at most 100,000 years. These ancient fossils should have no carbon-14 remaining at all. When tested for carbon-14 they should yield an "infinite" age but they do not because they do in fact have carbon-14 remaining. What is the explanation of this phenomenon? It is also very interesting that carbon-14 is being found in the soft tissues of dinosaur bones in significant quantities. A team of researchers gave a presentation at the 2012 Western Pacific Geophysics Meeting in Singapore, August 13-17, at which they gave 14C dating results from many bone samples from eight dinosaur specimens. All gave dates ranging from 22,000 to 39,000 years, right in the 'ballpark' predicted by creationists. It appears that the researchers approached the matter with considerable professionalism, including taking great pains to eliminate contamination with modern carbon as a source of the 14C signal in the bones. 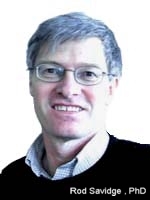 The lead presenter was Dr Thomas Seiler, a German physicist whose PhD is from the Technical University of Munich. This video presentation was up on YouTube at the time of writing this report (Link). In testing the Tandem Accelerator Mass Spectrometer (TAMS), a major problem appeared. Normally as in any test with decay counting, background counts must be made. Usually, fossil carbon is used for the background count since it is assumed that the fossil carbon is anywhere between 60 and 600 million years old and therefore cannot possibly have any 14C left. However, as previously noted, fairly high levels of carbon 14 are in fact present in these samples. R.H. Brown reported in Origins 1988(15), p. 39-43 that "infinite age" samples of fossil carbon are being reported in the literature as having C-14 ages in the 40,000-year range. The laboratories doing this research are from Europe, Canada, and the USA (Brown et al. 1983; Jull et al. 1986; Beukens, Gurfinkel, and Lee 1986; Grootes et al. 1986; and Bonani et al. 1986). "Contamination from our present Biosphere" was the most widely used interpretation to explain the presence of these "unexpected results". The journal Radiocarbon (Vol. 29, No. 3, 1987) contains two different reports from groups that attempted to explore the limits of this "contamination". The first group, from Simon Frazer University in British Columbia (Vogel, Nelson and Southon 1987) measured 43 samples of anthracite (coal) from Pennsylvania, USA, that had been given the best known pretreatment to remove contamination by modern carbon. The sizes of the samples ranged from 0.5 to 20 milligrams. They all yielded around 43,000-year carbon 14 dates, regardless of the sample size. Again this finding was attributed to machine background and contamination during sample preparation. The second group, from the University of Toronto in Ontario (Gurfinkel 1987) stated that "One of the major problems encountered in this study was the apparent presence of 14C contamination in samples that were assumed dead . . . it could not be assumed that even the oldest samples were necessarily 14C free" (p. 342). Gurfinkel, went through a meticulous process using graphite, calcite, limestone and anthracite samples to come up with her conclusions. And, all she could say is that "infinite age" samples should be expected to have "contamination" giving dates as recent as 43,000 years, which is similar to what the Simon Frazer University group obtained. As more and more groups looked at this problem, it has become common knowledge that there is a wall this side of about 50,000 14C years that cannot be passed in practice. Now, consider that if the "background noise" was really a problem that even if no sample was in the detection machine that the machine would still report background noise corresponding to ages less than 50,000 years. This is not what happens. According to Schmidt et. al., no counts were detected in 30 minutes giving an age greater than 90,000 years.18 Geological graphite was also tested and gave an carbon 14 age of almost 70,000 years. Compare this with "infinite age" samples of fossil coal, oil, bone, ect., that all date less than 50,000 years.17 Certainly background noise cannot explain such a discrepancy. So, what about other sources of actual contamination? The theory of the de novo production of carbon 14 by surrounding radiation is presented as one source of possible carbon 14 formation/contamination. However, to explain the current rather high levels of 14C in coal, oil, and other ancient carboniferous fossils, the amount of surrounding radioactivity must have been much greater in the past. For example, lets say we have a 10 million year old specimen with enough 14C in it to give it an apparent age of 40,000 years. In order for this level of 14C to be the result of surrounding radioactivity the initial level of radioactivity 10 million years ago had to be far above lethal levels (high enough to glow like a light bulb).16 Also, such sources of surrounding radiation had to be very widely present throughout the entire geologic column since all samples of coal, oil, and other organic fossils show approximately the same rather high levels of carbon 14. This level of contamination would be hard enough to believe with oil and gas, but would be extremely incredible with coal since many coal seams are hundreds of feet thick and very pure without evident radiogenic contamination significant enough to explain the high carbon 14 levels generally found in coal fields all over the globe. Clearly there is a problem here. The common explanations given simply do not explain the obviously high levels of 14C in supposedly ancient organic specimens to my own satisfaction. These specimens often come from deep in the earth in areas that are effectively shielded from environmental carbon interaction or contamination. Without the possibility of carbon exchange with the external environment, how could such specimens be contaminated? It seems practically impossible for contamination of all such specimens to have occurred, and yet they all show that relatively high levels of 14C remain. And yet, for scientists studying this problem, the answer must be contamination because obviously these fossils are millions of years old. But, what if the fossils are not millions of years old? What if they died recently and were buried recently? What theory is most consistent with the evidence? What we have here is no more than shorthand or sloppy translation from the Russian! The coal is nothing more than charcoal from an archaeological deposit. This sample is even included in the section of the report dealing with archaeological samples, and the paragraph discusses archaeological data. The odd use of terms is shown clearly in another radiocarbon date, Mo-353, reported on page 315 of the same article. It reads "Charcoal from cultural deposits of a fisher site. The coal was coll. from subturfic humified loam"
But the term "coal" in place of "charcoal" was enough to fool Ken Ham, as well as dozens of subsequent creationists who apparently were salivating to find 300 million year old coal radiocarbon dated to recent times, and who repeated Ham's false claim without bothering to check its accuracy. R. E. Taylor, Major Revisions in the Pleistocene Age Assignments for North American Human Skeletons by C-14 Accelerator Mass Spectrometry, American Antiquity , Vol. 50, No. 1, 1985, pp. 136-140. Melvin A. Cook, Nonequilibrium RadioCarbon Dating Substantiated, Vol. 2 (Pittsburgh, Pennsylvania: Creation Science Fellowship, 1986), pp. 59-68. Robert E. Lee, Radiocarbon: Ages in Error, September 1982, pp. 116-117. Velikovsky, 1955, p.287; CRSQ , 1965, 2:4, p.10. Vinogradov, A.P. ; A.L. Devirts; E.I. Dobinka; and N.G. Markova. Radiocarbon dating in the Vernadsky Institute I-IV. Radiocarbon, Vol 8, No. 1, 1966, pp. 292-323. Andrew Snelling, First published in: Creation Ex Nihilo 20(1):24-27 December 1997 Ã¢â‚¬â€œ February 1998. Ferguson CW. 1969. A 7,104-year annual tree ring chronology for bristlecone pine, Pinus aristata, from the White Mountains, California. Tree-Ring Bulletin 29(3-4):3-29. Yamaguchi DK.1986. Interpretation of cross correlation between tree-ring series. Tree-Ring Bulletin 46:47-54. Snelling A.A., Stumping Old-age Dogma. Creation, 1998, 20(4):48-50. Snelling A.A., Ã¢â‚¬ËœDating Dilemma,Ã¢â‚¬â„¢ Creation, 1999, 21(3):39-41. Giem PAL. 1997b. Carbon-14 dating methods and experimental implications. Origins 24:50-64. Kuniholm P.I. 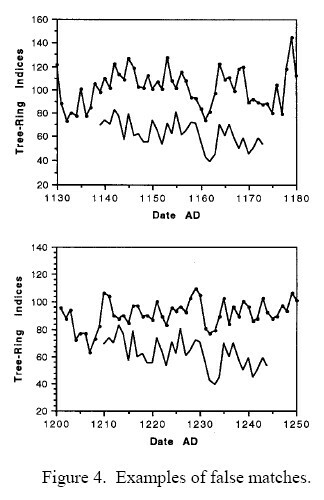 (2002), "Archaeological dendrochronology", Dendrochronologia 20: 63Ã¢â‚¬â€œ68. 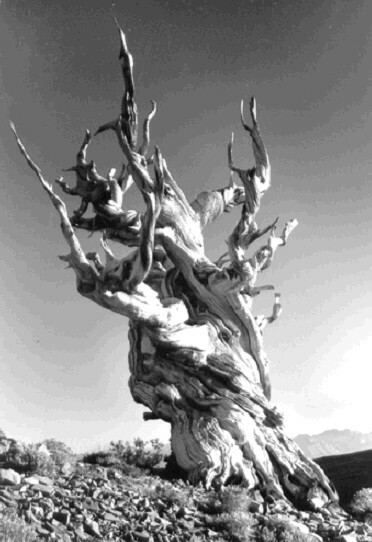 Lammerts, Walter E. Are the Bristlecone Pine Trees Really So Old?, Creation Research Society Quarterly, 20:108-115, September, 1983.